It was just another normal day. “Say ‘Yes’ to the Dress!” was on in the background and I was perusing NET-A-PORTER for the latest trends, when BAM, I spotted a delicate, bow-embellished sling-back kitten heel. “Bruno Magli!” I thought, “metallic jacquard, baby pink, that can’t be right.” But right it was. 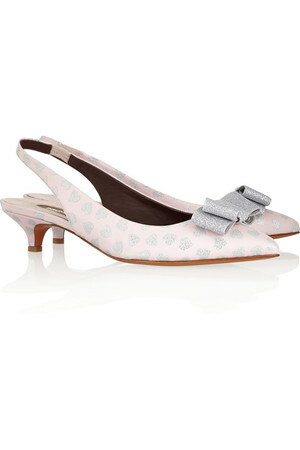 I moved on to their website to discover a slew of gorgeous, ladylike shoes. The Rotsee was one of the first pairs to catch my eye. In fuchsia, red, or violet velvet, this pointy-toed, bow embellished pump is an obvious classic. I then noticed the mirrored gold, chunky heeled, stone embellished Baba sandal. Yes, please. To make a long story short, amongst the classic, boring basics lie a few fabulous gems. Happy Shopping!